This personalized keepsake celebrates that exciting moment when she becomes Queen of Hugs. Cuddles, kisses, cookies: Is there anything better than becoming a grandma? This personalized photo art celebrates such an exciting milestone, with a favorite photo capturing the special bond, and your choice of illustrated flower that represents baby's birth month (February, for example, features a beautiful iris). Add everyone's names ("nana" counts, too) and the little one's birthdate, then give the unique keepsake to the grandma who knows how to dote with the best of them. Illustrated by Patricia Carlin. Printed and framed in Oregon. Also check out our Family In Full Bloom Photo Art. Cuddles, kisses, cookies: Is there anything better than becoming a grandma? This personalized photo art celebrates such an exciting milestone, with a favorite photo capturing the special bond, and your choice of illustrated flower that represents baby's birth month (February, for example, features a beautiful iris). Add everyone's names ("nana" counts, too) and the little one's birthdate, then give the unique keepsake to the grandma who knows how to dote with the best of them. 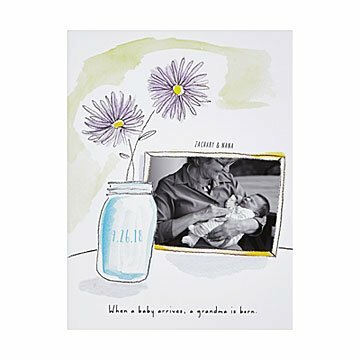 A Grandma is Born Photo Art is packaged in a partially recycled and fully recyclable/compostable box. There's one place—and only one place—where you'll find the A Grandma is Born Photo Art: UncommonGoods. Unframed prints are 12.5" x 9.5" and 10" x 8".